Politicians in Pakistan agree on little these days. In a country where partisan rivalry runs high, and regional and religious politics compound deep sectarian and ethnic differences, divisiveness is a constant. However, in the last two weeks I have seen consensus around at least one issue: the need to address civilian losses from armed conflict and terrorism in Pakistan. Over the past year, my organization CIVIC has been working here in Pakistan to document and publicize the losses suffered by civilians as a result of a range of conflict-related violence–from terrorist bombings to military operations and US drone strikes. The scale of the problem is massive. Our research indicates there are more civilian casualties in Pakistan than in Afghanistan. In 2010, it is estimated over 9,000 civilians were injured or killed in conflict-related violence. We have taken our findings to the Pakistani government, US officials and the international community to push for compensation and other forms of assistance for victims. Encouragingly, the Pakistani government has committed itself to making amends by creating programs to compensate victims for their losses — yet deficiencies and gaps mean many are left without help. This month, in cooperation with the Open Society Institute (OSI) and the Pakistani civil society group Institute for Social and Policy Sciences (I-SAPS), I have been participating in consultations with government ministers and civil society organizations across the country to discuss reforming victim compensation in Pakistan. Sober reminders of the conflict pervaded these consultations. In Punjab, the meeting was interrupted by the shocking announcement that the governor had just been assassinated. Just yesterday, as we met with government ministers in Peshawar, capital of Pakistan’s hardest-hit province, attacks on Shia processions in Karachi and Lahore killed at least 13 people and injured many more. Personal tragedies also loomed in the background. The chairperson of our discussion in Peshawar, Information Minister Mian Iftikhar Hussain, lost his son last July when he was assassinated by militants. Mercilessly, as the family received mourners two days later, a suicide bomber struck the Minister’s house, killing seven more. Well aware of the terrible human toll of the conflict, government officials have mostly agreed on the need for reform of compensation mechanisms, as CIVIC and others have been pressing for. For Pakistani victims, such reforms are urgently needed. Current compensation policies and practices are ad hoc — resulting in inconsistent compensation amounts, long delays, and an opaque and often politicized process. Many victims also lack access to compensation, including victims of drone strikes, internally displaced persons, victims from the Federally Administered Tribal Areas (FATA), and vulnerable groups such as women and children. For many victims, compensation is not just about money — it is about the government recognizing their suffering and expressing sorrow and regret. In this way, efficient and effective compensation mechanisms not only provide victims with meaningful help, but also help dignify their losses. In my interviews across Pakistan, I found that in the eyes of war victims and the Pakistani public, such efforts greatly enhance the legitimacy of the Pakistani state. There are significant challenges, to be sure. Identifying and verifying victims, especially in insecure environments such as FATA and KP, is undeniably difficult. Serious financial constraints also confront provincial and national governments already burdened by insecurity, underdevelopment, and relief and reconstruction needs following last year’s devastating floods. Pakistani politicians also rightly point out the need for the international community, particularly the US, to support compensation initiatives. Both moral responsibility and strategic interest clearly counsel helping the Pakistani government to provide direct, timely assistance to civilian victims of the conflict. But the need for international assistance should not distract the Pakistani government from implementing reforms and improving their own, existing compensation programs. Adopting legislation, stream-lining and standardizing the process and properly informing victims are straight-forward, unilateral measures that could dramatically help get assistance to those who need it. Moreover, such efforts would ensure transparency and accountability — both critical in order for the US and other international partners to directly finance such programs. Reminders of the conflict’s toll are everywhere in Pakistan. Peering through the window of our conference room in Peshawar yesterday, we could see where a 2009 bombing had leveled an entire wing of the hotel. After our meeting, numerous participants approached me to discuss their own experiences and losses. The reality is that Pakistani government officials and civil society members know all too well the devastating losses civilians suffer from the conflict. Consensus is not typical in this divided country. But hopefully the common scourge of conflict, terrorism, and militancy can provide a foundation for common action — and the political and popular will to recognize and address the losses of those who suffer most. Children playing in a field in Jalozai camp, surrounded by thousands of tent homes. I’m in Jalozai camp in northwest Pakistan. Built on a barren, dusty plain, it is a massive tent city with over 80,000 displaced persons. Residents of Jalozi have little or no access to employment. They are completely dependent on UN agencies and NGOs for food, water, and other essentials. Plastic sheeting around ‘blocks’ of tents provide a minimal sense of privacy and security. Firewood is scarce and though winter is approaching, UNHCR has been unable to offer heavier, winterized tents. Many have been here for up to two years. I met Ghulam Noor here, sitting on a metal bed frame in a dusty field, chatting with some friends. He’s 22, but already married with a four month old baby. He has been living in Jalozai for a year. Last October, Ghulam Noor was in his village bazaar when a Pakistani helicopter gunship opened fire. He was hit by shrapnel in the leg and head and is now paralyzed from the waist down with minimal movement in his arms and hands. He says what he needs most is medical assistance. His father and family pooled money to pay for initial treatment, but he requires additional care for paralysis and the shrapnel still lodged in his head. Ghulam says he is depressed, can no longer work, and is completely dependent on the support of his family to survive. For those like Ghulam who have to cope with a debilitating injury as a result of the conflict, life in Jalozai camp is especially difficult. There are no facilities for the disabled and little or no assistance is offered to such persons or their families despite the unique challenges they face. Talking to victims in Jalozai, a feeling of powerlessness and senselessness pervades their stories. For Ghulam, all he wants to do is walk again and can’t understand why the helicopter that paralyzed him opened fire. For others, all they want to do is return to their villages and rebuild. But no one knows how or when they will be able to move forward with their lives. 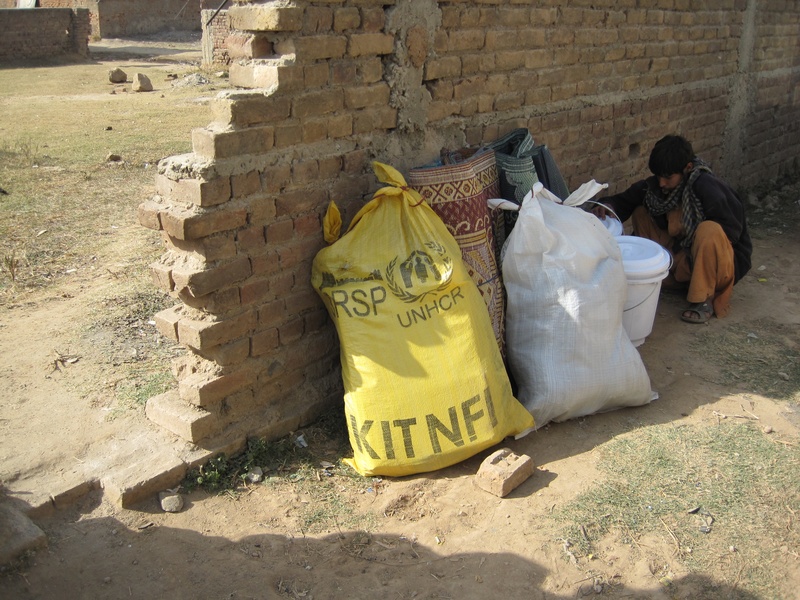 Child crouching next to bags or 'kits' of non-food items (NFIs) distributed to IDPs. NFI kits typically include kitchen items, blankets, mats, and a bucket. 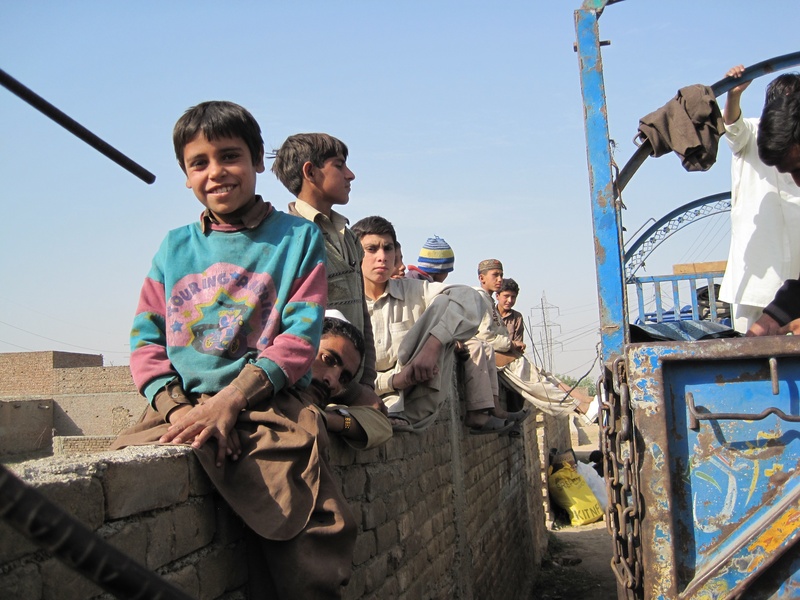 Life is difficult for internally displaced persons (IDPs) in Tarnol—a slum outside of Islamabad. It is a dusty, desolate place on the outskirts of the city. Its streets are narrow and unpaved, lined with cramped homes, many held together by earthen bricks and animal dung. Most of the displaced are crowded into relatives’ homes or renting small rooms. They struggle to sustain large, extended families on less than $2.50 a day—the amount men can earn unloading trucks in nearby industrial areas. Tens of thousands of IDPs, mostly from Swat Valley and Bajaur Agency, have settled in slums such as Taronl all around Islamabad. Along with millions of others, they were forced to flee their homes because of fighting between the Pakistani military and Taliban-aligned militants. Children of displaced families watch the distribution of NFI kits to a growing crowd of IDPs. I visited Tarnol with a Pakistani NGO, SHARP, which works with UNHCR to distribute non-food items to IDPs, such as buckets, blankets, and mats. By the time we arrived at the distribution point, a crowd of around a hundred men had already gathered. As the distribution got underway, it became clear that around half would not receive anything because they were from a different area and SHARP could not verify their registration. Intense negotiations with community elders ensued and the crowd grew increasingly agitated. Men with wooden clubs stood outside SHARP’s small office, attempting to keep control. Despite the aid distributed, the desperation of the people was evident. In an unfamiliar city, far away from their villages and farms, many families are dependent on the meager and sporadic aid provided by relief agencies. They want to return and resume their lives but continuing insecurity and lack of money prevents them from doing so. In the meantime, many fear what has happened to their homes, property, and businesses—and how they will rebuild once they return. KABUL, Afghanistan – I’ve written generally in the last few blogs about the compensation and victim assistance issues that CIVIC analyzed in our recent report. Let’s take a concrete example of the type of harm and redress we’re talking about. A few months ago, I met several families who lost relatives and friends in a July 2008 US airstrike that mistakenly targeted a wedding party in eastern Afghanistan. Forty-seven were killed, the vast majority women and children. Those visiting the site a few days after the incident described a road scorched and pocked with craters, body parts and bits of wedding veil mixed into the rubble. The irony is that the tools necessary to do right by these families were already there. Most international military forces in Afghanistan – the US included – have non-legally binding slush funds for providing civilians with recognition and help when they are harmed. The United Kingdom gave an estimated £700,000 between April 2006 and October 2008; the U.S. obligated more than $876,137 for troops in the eastern region of Afghanistan between January 2006 and November 2008; Canadian troops paid approximately $243,000 from 2005 to 2008. The Afghan government fund paid in excess of $5 million to victims or their families in 2007. Sadly, in Afghanistan, good intentions (or at least sound allocations of funding) have been weighed down by liability concerns, bureaucracy, lack of coordination, and lack of initiative. I interviewed 143 civilians for our latest CIVIC report, and only a handful had received any of these compensation or ex gratia payments. Most international troops expect Afghans to come to them when an incident happens. But while troops say they have an “open door” to Afghan civilians, Afghans find that door is barricaded by barbed wire and heavily armed, hostile men. Most troops have funds to give, but there is no common policy among the international forces and no mechanisms for forwarding claims among the 41 different partners of the NATO mission there. So unless an affected family can identify which troops were involved and bring the claim to those troops directly, they have no chance of getting any answers, any help. The bottom line is that it’s not enough to just fund a compensation mechanism: we need to own it. It’s true, no amount of compensation will bring back a loved one. By the same token, no amount of military or development spending will persuade the Afghan people to support military “outsiders” who treat the deaths of their families, friends and neighbors without recognition or compensation. KABUL, Afghanistan – I arrived back in Kabul this week. With the snow already melting, many fear that spring – and with it a spring offensive by the Taliban – is already on its way. If past years are any guide, those bearing the lasting costs of an escalation in the conflict will be the civilian population. The CIVIC report we released last week goes in depth on what happens to families caught in the conflict, and what warring parties can do to help them recover. Now the trick is getting someone to pay attention. Increased fighting last year led to a 40% increase in civilian deaths, according to the United Nations. The Afghan population is tired of watching their friends, family members, and communities torn apart by conflict, and often without any response from an international community that came into Afghanistan with promises of help and peace. I interviewed a man a few months ago who lost several family members and his home to airstrikes in the southern province of Kandahar: “We are not happy with the coalition forces or the AGEs. We are stuck in the middle of them and we cannot escape,” he told me. There’s a great photo New York Times slideshow, the Wounded of Afghanistan, by photojournalist Lynsey Addario that captures more than any words can what Afghan civilians have already suffered in the conflict. NATO countries have the money for compensation and victim assistance programs, and at least among most countries and the Afghan government, there seems to be the will to do something. After all, the amounts needed for victim support pale in comparison to other military expenditures, and providing some help and recognition can have quite a big “hearts and minds” impact. At the least they can forestall some of the community resentment and anger that happens when civilian losses go unrecognized and ignored. Sadly, money and good intentions seem to go only so far in Afghanistan. On the one hand people tell me civilian casualties and compensation – now a regular part of President Hamid Karzai’s re-election stump speech – have become too politicized. But then a UN official told me compensation and assistance mechanisms are not a high enough priority vis-a-vis other urgent human rights issues to get any kind of sustained attention and resources. And in between these two perspectives, thousands of affected families continue to struggle on their own for recognition and help.